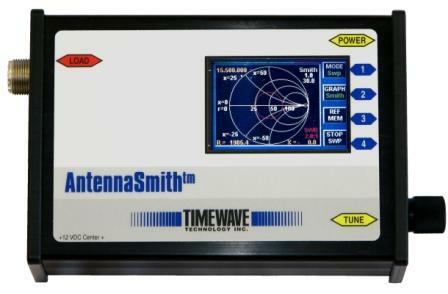 Day or night, the Timewave TZ-900 AntennaSmith is a bright colorful window to your antenna system. The transreflective TFT LCD color display is brilliantly visible in direct sunlight - no lost data from a washed-out display! graph to print later or to display as a reference while you optimize your antenna system. Instantly see the effect of an adjustment or a change! No computer connection is required to see all the graphs - even the Smith chart! with 1 Hz frequency resolution. The included Windows program lets you display, compare and export your data. Use your PC or laptop to run the AntennaSmith for quick printed reports. The AntennaSmith has a rugged extruded aluminum case and batteries for hours of field operation. A 12 VDC power supply/ charger (117VAC/60Hz) is included.